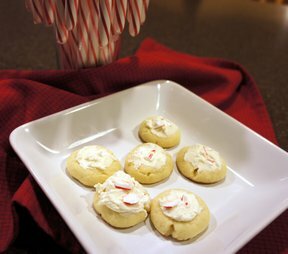 A creamy and minty filling in the center of these light and soft cookies. Topped with the crushed candy canes, they will be the center piece of you holiday treat platter. Slowly add the flour and mix well. If dough is too crumbly add a few teaspoons of milk until it is well mixed, but not too wet. Shape into 1-inch balls and place 2 inches apart on an ungreased cookie sheet. 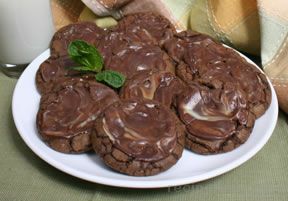 With thumb or spoon, make indentation in the center of the cookie. 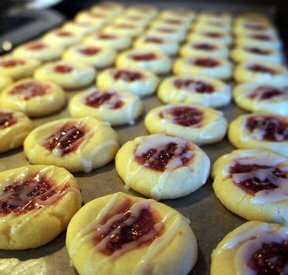 Bake at 350Â° for about 10-15 minutes or until the edges are lightly browned. Immediately remove from sheet and cool. For filling, combine powdered sugar, cream cheese, milk and mint extract together. 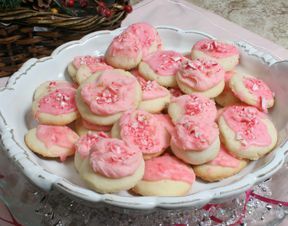 When cookies are cooled, fill with filling mixture and top with crushed peppermint candies. "Great flavor! The frosting is delicious and we had a little cookie with our frosting :) I like the color that the crushed candies gave these light cookies."